Here is another lovely color from Sharon Townsend's "SPNEA'S Historic Colors of America". It is called Cogswell Cedar. It is a yummy combo of brick, orange, yellow and teal. 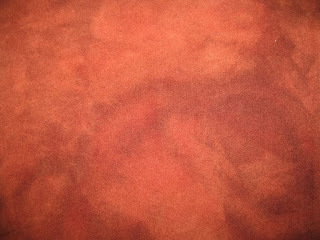 This piece was dyed over 1/2 yd of Dorr wool in a Presto Pot with shallow water and little to NO stirring. Click on the photo to see the rich mottled effect and loveliness of value.